COLUMBUS, Ohio — We love how our dogs, our cats, our horses make us feel. But why? That's part of Kelly George’s job, to understand the animal-human bond, why each can benefit each other’s emotional and even physical health. 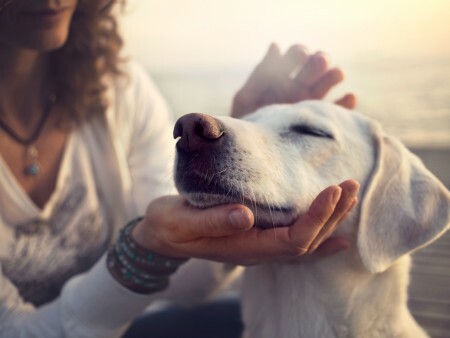 Stroking a pet can release serotonin, prolactin and oxytocin, feel-good hormones known to reduce stress in both the person and the pet, said George, an assistant professor of animal sciences in The Ohio State University’s College of Food, Agricultural, and Environmental Sciences (CFAES). George led the effort to start the college’s new Center for Human-Animal Interactions Research and Education (CHAIRE) to encourage research into the human-animal bond. CHAIRE faculty from various disciplines at Ohio State and the community will be involved with research associated with the center, including Veterinary Medicine, Public Health, Social Work and Nursing as well as CFAES, all of whom share an interest in animal-human connections. The center’s research will focus on the conservation of wildlife, the health benefits of having animals, and the welfare and treatment of animals, including those raised on farms. The launch of the center will be celebrated Dec. 7 with a kickoff event featuring a slew of animals, including an African black-footed penguin, a two-toed sloth, goats, miniature horses and several companion dogs. The kickoff event, which will be from 5 to 8 p.m., will include animals from the Columbus Zoo and Aquarium. Attendees can mingle with the animals and the people who study or train them in the Department of Animal Sciences’ Price Arena, 111 Animal Science Building, 2029 Fyffe Court, on the Columbus campus. The deadline to register is Dec. 4. The event is free and open to the public. In her research, George focuses on an aspect of the human-animal bond that’s less talked about, the impact humans have on animals. George is pursuing funding for a study that would examine the effect of introducing a dog into therapy sessions with children whose mother, father or both are addicted to opioids. In some therapy sessions in which children are reluctant to interact with the counselor, a dog can be brought in to encourage the child to talk, first to the dog and eventually to the therapist. Joe Guada, an associate professor of social work, is studying how pets help the physical and emotional wellbeing of homeless individuals and people at risk of becoming homeless as well as the impact on the dogs’ health. Guada will work with veterinarians from the College of Veterinary Medicine and a local nonprofit organization that provides free vet services for the homeless. “The relationship with their dog or cat is very important to them. They see the animal as something to care for and that adds to their own sense of importance,” Guada said. People struggling with a severe mental illness, such as bipolar disorder or an addiction, report that their pets help stabilize them during challenging times, and that they were less likely to spend money on cigarettes or alcohol because they had to pay for food for their pet, Guada said. “The pet offers a bond for people who are typically isolated, ignored,” he said. Homeless people find that other people will talk to them more often if they have a pet with them, he said. The center has partnered with a number of organizations outside of the university including the Columbus Zoo and Aquarium and the Buckeye Ranch, a residential treatment center in Franklin County that offers equine therapy for some of its residents. Horses have been shown to be effective in working with young adults who bully because horses won’t be bullied. Horses too can be key in helping bring about conversation between parents and children who may be resistant or unable to communicate with each other. A child can be blindfolded and seated on a horse while the parent stays on the ground giving the child oral directions on where to take the horse: straight, right, left. Both must listen to each other well and learn to talk to each other. For more information on the center, visit: go.osu.edu/petlove.